Method for Base: Melt butter and pour in a 9 inches cake tin. Sprinkle brown sugar on it. 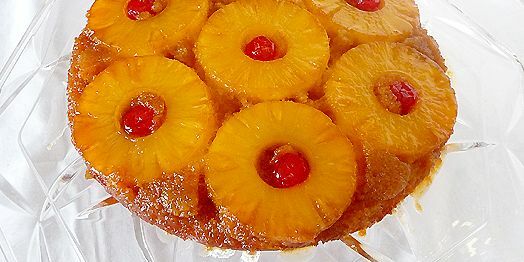 Then put pineapple slices and the cherry in the center of each pineapple. Method for Cake: Preheat oven on 180 degrees. Sieve flour and baking powder thrice, beat butter and caster sugar till light and fluffy. Add in egg one at a time and continue to beat well after each addition. Till all four eggs have been added. Add in essence and color. Fold in the sieved flour and baking powder mixture along with pineapple syrup. Mix lightly. Pour over the prepared base. Level properly and bake for 45 minutes. Remove and cool.